Alan R. Graham, Ph.D., PCC, MCAC is Dean of ADD Coach Training for Mentorcoach. He has served on the Editorial Board of The Journal of Attention Disorders and was on the board of the Professional Association of ADHD Coaches (PAAC). 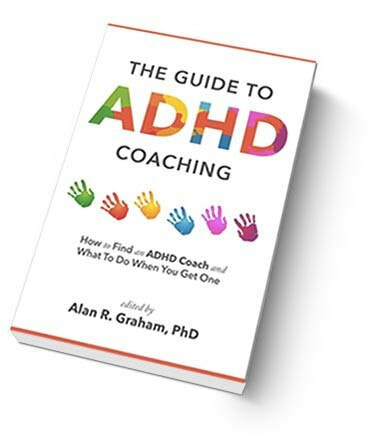 Alan coaches executives with business and organizational challenges and adults, teens, children and parents impacted by ADHD. His website, ADDvisor.com, offers practical information about ADHD. He has helped many individuals benefit from Cogmed Working Memory Training. Alan is the lead author of Lemonade: The Leader’s Guide to Resilience at Work (2012) and the Resilience at Work Assessment (RAW-A). You can contact Alan at agraham@acp10.com. Elizabeth Ahmann, ScD, RN, PCC, NBC-HWC is an ADHD and Health and Wellness Coach in private practice in the Washington DC area. Dr. Ahmann is a National Board Certified Health and Wellness Coach, is credentialed by the International Coach Federation at the Professional Certified Coach level, and has a Masters degree in Nursing and a Doctorate in Public Health. Editor of the “Family Matters” column for Pediatric Nursing, and member of the Research Committee of the ADHD Coaches Organization, she frequently publishes, and presents at conferences, on topics including coaching, research, evidence-based practice, and ADHD. She also teaches classes for coaches and others in mindfulness for ADHD. Dr. Ahmann is a faculty member in the Health and Wellness Coaching Department at Maryland University of Integrative Health. Paula Altschul, MN, PCC is a life coach, who works with teens, college students, and young professionals who have ADHD. Paula’s work is based on a strength-based, positive psychology background. Her academic background is in nursing and parent education. Paula received her master’s degree from the University of Washington and began her professional life as a Family Nurse Practitioner and parent educator. Paula is a graduate of MentorCoach and Edge Foundation. She is a member of the ICF, the ADHD Coaches Organization (ACO), CHADD, and the Institute of Coaching. Laurie Dupar, PCC, international expert on ADHD, is a Credentialed ADHD Life Coach, Mentor Coach and Psychiatric Nurse Practitioner, specializing in working with clients of all ages who have been diagnosed with ADD/ADHD and want to understand how their brain works, minimize their challenges and get things done! In addition to her private coaching business at Coaching for ADHD, in 2015 Laurie founded the International ADHD Coach Training Center (IACTCenter) where she trains and mentors emerging ADHD Life coaches to create a successful, profitable, holistic service based coaching business they love. Find out more about private coaching with Laurie at www.coachingforadhd.com and her training school at www.iactcenter.com. Christina Fabrey, M.Ed., PCC, BCC is the Director for the Center of Advising and Achievement at Green Mountain College (GMC), an environmental liberal arts college in western Vermont, where she previously served as the school’s director of academic support services and disability support provider. She currently incorporates coaching into her work with students who have disabilities at Green Mountain College, as well as with students who are on academic probation or conditionally admitted to GMC. Christina is a certified life and ADHD coach. She received the 2009 Emerging Professional award from Vermont Women in Higher Education for her innovative work with coaching in the college setting and is a contributing author of Becoming Self-Determined: Creating Thoughtful Learners in a Standards-Driven, Admissions-Frenzied Culture (2016), Field & Parker (editors). For more information, visit www.vtcoaching.com. David Giwerc, MCC, MCAC, is Founder and President of the ADD Coach Academy (ADDCA), www.addca.com, the first and largest comprehensive ADHD coach training program accredited by the ICF and PAAC, the governing bodies of the Life Coaching and ADHD Coaching Professions. For 20 years, his coaching practice has been dedicated to empowering entrepreneurs and executives who have ADHD. He serves on the advisory boards of the Professional Association of ADHD Coaches and the Attention Deficit Disorder Association. Giwerc is the author of Permission to Proceed: The Keys to Creating a Life of Passion Purpose and Possibility for Adults with ADHD). David was recently inducted into the 2016 CHADD Hall of Fame. Honorees to the CHADD Hall of Fame are recognized for their leadership, innovation and commitment to serving the ADHD community. Earlier in 2016, David was presented with the 2016 Founders Award by ACO, the ADHD Coaching Organization, for distinguished service to the professional ADHD community. Barbara Luther, MA, MCC, and Master Certified ADHD Coach, is Director of Training for the ADD Coach Academy (addca.com) and was the founding President of the Professional Association of ADHD Coaches (PAACcoaches.org). Barbara has taught, mentored, and assessed young coaches for over 20 years. Barbara specializes in inattentive ADHD and coaches inattentive professionals and creative adults to rewrite their, “what’s not working” stories into appreciative and empowering stories about their unique brain wiring and strengths. Barbara is prominently featured in TotallyADD.com’s video, ADD & Coaching: You Don’t Have to Go It Alone and in her interviews with Jeff Copper at Attention Talk Radio. She is a regular speaker at ADHD and coaching conferences and hosts a community of learning for coaches who want to remain in touch with coaching competencies at www.SoaringCoachesCircle.com. You can reach Barbara through her web site at WindBeneathYourWings.com or by emailing Barbara@coach2soar.com. Texas, and is an ADDCA Certified Coach Graduate from the ADD Coach Academy. Diane has two children and lives with her husband in Kansas. Nora Misiolek, PhD, MBA, PCC is an International Coach Federation (ICF) Professional Certified Coach. She is President of Misiolek & Associates, a coaching business that works with ADHD clients ranging from preteens to adults, as well as with Executive, Business, and Career clients. She previously held professorships at Marist College and Syracuse University, where she is still an adjunct professor. She is currently an online faculty member and Mentor Coach at the Maryland University of Integrative Health. She holds a PhD and an MBA from Syracuse University. Robin Nordmeyer, CLC, is the Managing Director of the Center for Living Well with ADHD in Minnesota. She began supporting the needs of parents of children with ADHD in 2008 as a Certified Parent to Parent Trainer. Robin completed her Life Coach Certification, through Adler Graduate School and her ADHD Coach Training through MentorCoach. She launched her coaching practice in 2011 and works with adults, parents and youth, helping them learn how to leverage their strengths and persevere through the challenges of having ADHD to experience a high quality of life filled with much joy and success. Robin serves on the Board of ADHD Coaches Organization in the capacity of Programs Chair. She has held many leadership roles and is passionate about personal and professional development. You can learn more about Robin, her partners Kay and Katherine, and the support and services available to clients nationwide at www.CenterForLivingWellwithADHD.org. business community. Paul is the author of a forthcoming book on ADHD in the workplace and is a co-author of the book, 365 +1 Ways to Succeed with ADHD. He has served as secretary of the Professional Association of ADHD Coaches (PAAC) since its inception in 2008. Linda Roggli, PCC is a Professional Certified Coach, award-winning author and founder of theADDiva Network for ADHD women 40-and- better. She is an expert in later life ADHD; her book “Confessions of an ADDiva: midlife in the non-linear lane,” won first prize in the Next Generation Independent Book Awards. She has coached hundreds of women through private and group coaching as well as ADHD women’s retreats. She served as vice-president of ADDA and has chaired its webinar series since 2009. She is the ADHD expert on Selfhelp.com and a guest blogger for sixtyandme.com. She is a popular speaker at national and international conferences. Her office is headquartered in Durham, NC where she lives with her non-ADHD husband and two very ADHD Shelties. Micah Saviet, BS, CNA, received his undergraduate degree, with a focus in Clinical Psychology, from Towson University in Spring 2017. He is currently a Masters of Social Work student at the University of Maryland School of Social Work. Micah is interested in both research and clinical aspects of the mental health system, focused on evidence- based practice with underserved populations as well as a wide-variety of clinical disorders. He is particularly drawn to exploring client-centered, behavioral-based strategies aimed at helping individuals with ADHD cope more effectively, and even thrive. Micah is co-author on a number of publications and conference presentations and enjoys continued involvement with several ongoing research projects. He can be reached at: msaviet@gmail.com. Elaine Taylor-Klaus, PCC, CPCC, is the co-founder of ImpactADHD®, an award-winning global resource providing parents with an innovative coach-approach to navigate the challenges of raising complex children. A sought-after international presenter, Elaine trains and coaches parents; writes for the ImpactADHD. com and many other national publications such as ADDitude and Attention magazines; and served on the national Board of Directors of CHADD (Children and Adults with ADHD), as a parenting consultant for the American Academy of Pediatrics, and as a national expert for Pfizer’s Making Moments campaign for parents. The co-author of “Parenting ADHD Now! Easy Intervention Strategies to Empower Kids with ADHD,” and the co-creator of the Sanity School Behavior Management training program, she is first and foremost the mother in an ADHD Family of 5. ​Lisa Joy Tuttle, MA, BCC, CSS, is an executive skills and career coach at the Penn Adult ADHD Treatment and Research Program at the University of Pennsylvania’s Perelman School of Medicine and an Instructor on the faculty of the Institute for Life Coach Training. She has a Master’s in Applied Psychology and is a Board Certified Coach through the Center for Credentialing and Education and a certified Career Services Specialist, through the Edge Foundation. Lisa coaches, lectures, and consults internationally and her research with Elizabeth Ahmann and Micah Saviet is reported in the journal Pediatric Nursing (2017) and Journal of Postsecondary Education and Disability (2018). Linda Walker, PCC, is a Professional Certified Coach specializing in coaching working adults with ADHD. Since 2005, Linda has provided specialized ADHD coaching and training to entrepreneurs, professionals with ADHD and other creative geniuses who struggle with productivity, organization and focus. Linda continues to coach executives, professionals and managers with ADHD. Finding that traditional productivity strategies and tools fall short when used by adults with ADHD, Linda has created several training programs designed especially for working adults with ADHD. Linda also serves on the Attention Deficit Disorder Association Board of Directors as Chair of ADDA’s Workplace Committee.